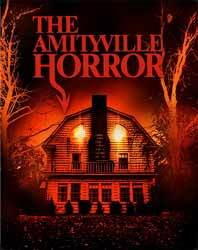 The Amityville Horror is a horror classic by virtue of its highly successful cinematic release in the late seventies. It was certainly considered the definitive ghost story for a long time. The original book by Jay Anson was very popular, and justifiably so. Although the film employs a certain degree of poetic licence, the entire script was sold on the basis of true events. Whether you believe the astounding tale of the Lutz family, or think it hyped publicity, some of the ‘real’ victims are still around to state their case. But how has the film weathered over the decades? Haunted house stories are by their very nature slow-burners. Otherwise, the householders would be out of there before they had carried in a fraction of their belongings. Therefore, not a great deal happens in the first twenty-five minutes or so. Having said that, without witnessing the two main characters happy and productive, it would make little impact on the viewer when they are progressively changed by these events. The house is made to appear somewhat sinister with the glowing eye-like attic windows. There are subtle scenes of telekinesis, wherein objects are seen to move, but the much more believable affect the house has on people is to make them ill and physically sick. Priests in these sort of films are invariably troubled and seeking redemption; conversely, Father Delaney (Rod Steiger) is injured twice by the house and, after unsuccessfully attempting to warn the new owners, is incapacitated to the extent that he moves away and becomes a recluse. Much more convincing than returning to the house and facing death. The triumvirate of actors here is undoubtedly Rod Steiger (very convincing as the priest who is driven away from his calling), James Brolin (of Westworld fame, who plays George Lutz with a gradual immersive regression), and Margot Kidder (Lois Lane in the Christopher Reeve Superman films, as Kathy Lutz). This is still an enjoyable movie experience; older viewers will recognise this fact, whereas younger ones may be turned off by the slow pace. At nearly forty years old though, this ground-breaking haunted house story deserves proper recognition, so a limited edition steelbook is suitable justification. However, more impressive is the array of extras which alone gains this release an extra point: Separate Interviews with James Brolin, Meeno Peluce (the fiction Lutz boy), Sandor Stern (screenwriter), Lalo Schifrin (soundtrack composer), a Feature-length Documentary with Daniel Lutz, Featurette with James Brolin and Margot Kidder, an Intro by parapsychology PhD Dr. Hans Holzer (author of Murder in Amityville), an Audio Commentary by Holzer, and Trailers.